Michel Chiha was the founding father of the Lebanese Constitution and a distinguished statesman noted for his political and social commitment to his country. From an early awareness of the geographical and historical pressures weighing on its future, he foresaw that Lebanon would always face a “precarious existence”. 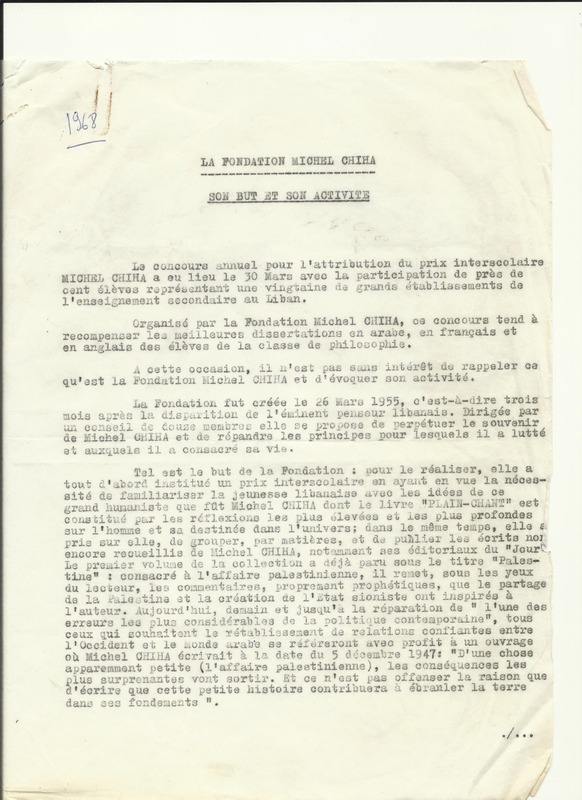 After his death in December 1954, his friends, his companions and his colleagues founded the Michel Chiha Foundation in 1955 to promote the patriotic principles by which he lived and for which he fought his entire life. President Charles Helou was elected head of the foundation. In 2001 the former minister Fouad Boutros succeeded him. In order to acquaint younger Lebanese with his philosophy and his thoughts on Lebanon, the foundation instigated an inter-school essay writing competition whereby an extract of his work is set as the topic and prizes are awarded to the best dissertations. After a long interruption owing to the civil war, in 2008 the FMC initially re-instated the competition at university level and then broadened it to secondary school level in 2015. Equally, the foundation commissioned the translation of a selection of his writings into Arabic and English, organized a number of conferences on his work both in Lebanon and abroad and put together the 2001 Pages of History exhibition of his archives in the Sursock Museum of Beirut. Former governor of the central Bank of Lebanon. Former minister. Former president of the National Council of Tourism. 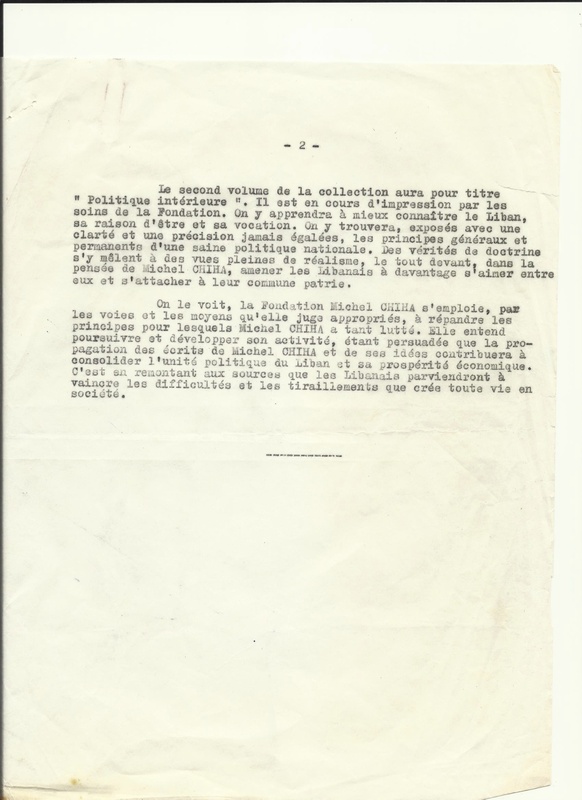 Worked as a journalist with the French language daily ‘Le Jour” owned by Michel Chiha. Appointed personal representative of the President of the Republic (1977)Participated in a number of official Lebanese Missions to foreign capitals as Attaché to the Political Department of the Ministry of Foreign Affairs. Published several articles and studies and delivered a number of conferences in the “Cénacle Libanais” and many other institutions. Co-Founder of the Banque Libano-Française of which he has been Vice-Chairman for many years. Has established his own law office in 1975 and since then has been a Member of the board of directors of Finance Bank, and Crédit Libanais Investment Bank. 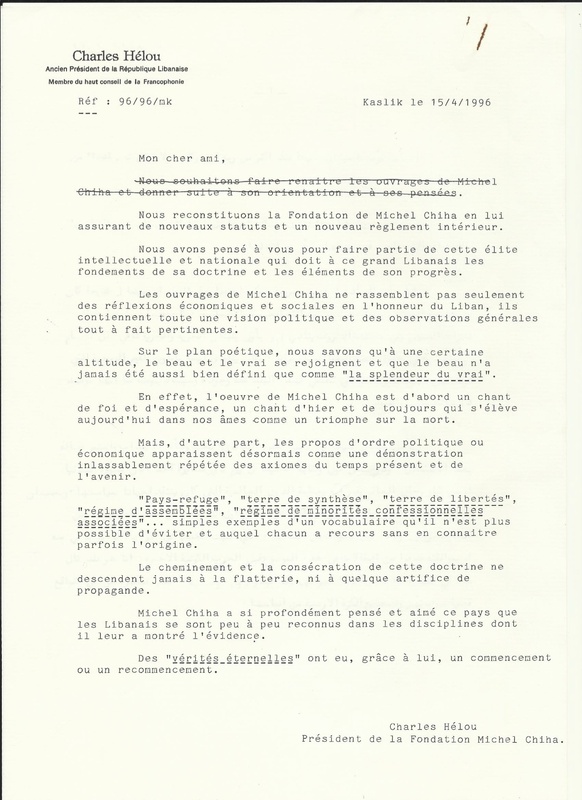 From 1981 to 1985 he taught Public Law at Université St Joseph. From 2002 to 2007 he was a Member of the board of directors of Near East Commercial Bank. From 1997 to 2006 he was a Member of the Committee of the Lebanese Center of Arbitration. From 1994 to 1998 he was a Member of the Committee for the modernisation of laws established by the Central Bank of Lebanon. Board member of the Lebanese Agricultural research institute (1989-2000). Co-Founder and board member of Liban-Lait s.a.l. (Candia). President of the association of protection and improvement of the Arabian horse in Lebanon (since February 1998). Elected MP on Rafic Hariri’s list (representing Christian minorities) (September 2000). Member of the Budget and Finance parliamentary committee during the period 2000-2014. Member of the Agriculture and Tourism parliamentary committee (2000-2005). Member of the Francophone parliamentary committee since 2000. Member of the Francophone international parliamentary assembly committee office since 2003. Elected MP for Beirut for the second time in May, 2005 on the list of the former Prime Minister Rafic Hariri. President of the Economy, Trade, Industry and Planning parliamentary committee (2005-2014). Elected Member of Parliament for Beirut for the third time in June 2009 on the list of the Future movement list. Minister of State for Administrative Reform since February 2014. Professor of Sociology at the Lebanese University. He retired in 2007. His numerous publications include studies dealing with various aspects of the Lebanese history, the lebanese political and social system and the Arab culture. Daugther of Michel Chiha and Marguerite Pharaon. Madeleine Helou is the wife of late MP Pierre Helou. She has been very active in non-governmental organizations such as the Société de Bienfaisance Latine, the Comite central des Dames de la Charité, the Lebanese Red Cross and Saint Vincent de Paul. Madeleine Helou was a member of the excecutive committee of the Baalbeck International Festival for over 40 years. She is now Vice-President of the Lebanese Academy of Gastronomy. MBE, FSA. Director since 1998 of the British Museum/Directorate of Antiquities of Lebanon excavations in Sidon. Special Assistant the British Museum. Honorary Senior Research Associate University College London. UMR 8167 Orient et Méditerranée, "Mondes sémitiques" CNRS. Founder of the Lebanese British Friends of the National Museum. Editor of the journal Archaeology and History in the Lebanon. Archaeological conservator specializing in the conservation of archaeological materials and surfaces. Former head of conservation at the Directorate General of Antiquities. Worked on several conservation projects for museums and archaeological excavations in Lebanon. B.A. Interpreter School of the University of Geneva. B.A. Art History Concordia University, Montreal. Michèle has been a guide at the Montreal Museum of Fine Arts since 1988. And in the past few years, she has been a guide at the AUB Archeological Museum and the National Museum in Lebanon. Michèle is also active in several non-govermental organizations in particular helping children with special needs. Professor of Sociology and Director of the Center for Behavioral Research at the American University of Beirut. He has also held academic appointments at Princeton, Harvard, MIT and New York University. He is the author of numerous journal articles and book chapters on comparative modernization, socio-cultural history, urbanization, and post-war reconstruction. He has been a recipient of several international fellowships and research awards and appointed on the international jury to review master plans for the post-war reconstruction of Beirut. He is a trustee of several foundations and serves on the editorial boards of a score of international journals and publications. Former President of the Catholic University of Paris, former Head of the Policy planning at the Ministry of Foreign affairs in Paris, Joseph Maïla is currently Professor of International relations and Geopolitics at ESSEC, Paris, France. Teacher of law at Saint Joseph University. He was also elected as vice president of Saint Joseph University. Author of several articles in law and politics, he was appointed as the general secretary of the Lebanese Pen Club and member of the Lebanese national commission at Unesco and elected as vice president of said commission. He has been also appointed as Minister in the government of the president Amine El hafez. Elected as president of the Beirut Rotary Club. Appointed as arbitrator by the International Court of Arbitration at the International Chamber of commerce (Paris). Holder of the Beirut Bar Association medal for practising the profession of lawyer during fifty years and until today. Associate Fellow of the Royal Institute of International Affairs, Chatham House where he directs a programme on the regional dimension of the Palestinian refugee issue in the Middle East Peace Process. He is also a senior member of St Antony's College Oxford where he was director of the Centre for Lebanese Studies from 1986 to 2005. He is a member of the executive board of the Centro de Estudios de Oriente Medio of the Fundacion Promocion Social de la Cultura in Madrid. In 2010 he was a visiting fellow at the Aspen Institute in Washington DC and in the summer semester of 2012 he was a visiting scholar at Tufts University. He is also a consultant to several governments and international organizations. He has several publications and contributes regularly to the media on Middle Eastern affairs.